A fun part of throwing a party, event or celebration is picking out the color scheme and decorations. It’s best when everything matches and there is a cohesive theme throughout. So, when Sobelle Favors was asked to create chocolates in conjunction with the invitation designer Michelle Downey of Simply Michelle – A Happy Occasion Art & Design Studio, we were thrilled! The party was a 90th Anniversary for a company with a 20s theme which played on their founded date in 1925. The colors were black and gold with some red undertones. The favors were our signature chocolate wrapped in copper tinted paper and a black wrap with little flowers. The coordinating chocolate favors and invitation package. Black and Gold make for a beautiful tablescape. 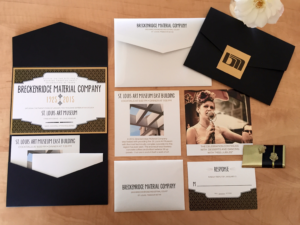 Coordinating the small things like favors and invitations is a great way to augment the theme and really play up the details. And it is a fun way for us as designers to work together and create something magical! 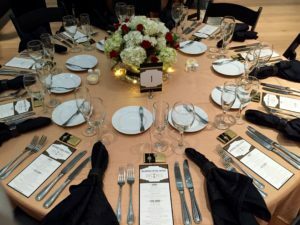 So as always, please give us a call if you are interested in adding that special element to your next event.